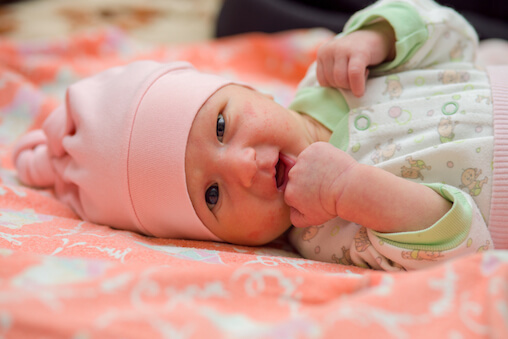 To many parents’ dismay, their beautiful newborn’s face breaks out with red bumps at around 3 to 4 weeks of age. This is called baby acne. It tends to occur at about the same age as the baby’s peak gas production and fussiness. How attractive! (This all coincides with parents’ maximum sleep deprivation.) Parents are often quite concerned both about how these bumps look and about their significance. The bumps of baby acne are quickly fleeting evidence of the connection between a mother’s body and her baby’s. During the final moments of pregnancy, her hormones cross the placenta into her child. Among other things (such as maturing the lungs), this stimulates the oil glands on the skin, eventually giving rise to the baby acne. Baby acne is a common newborn condition. It can be present at birth, but typically appears at 3 to 4 weeks of age. Fleshy or red pimples occur predominantly on the cheeks, but are also quite common on the forehead and chin. Whiteheads are sometimes present. The acne will be most prominent when the baby is hot or fussy (increased blood flow to the skin), or when the skin is irritated. If the skin comes into contact with cloth laundered in harsh detergents, or becomes wet from spit-up saliva or milk, the condition may appear worse for several days. Babies develop the acne from the maturing effect of mothers’ hormones. This condition tends to come and go until the baby is between 4 and 6 months old. Baby acne is recognized based on the timing and appearance. How is baby acne treated? Usually, no treatment is necessary. It can help to gently cleanse the face once a day with water. Oils and lotions do not help, and may aggravate the condition. If the acne is severe or lasts beyond 6 months, your pediatrician may prescribe a mild medicine to help. How can baby acne be prevented? Baby acne is a normal stage that is difficult to prevent. Try to take many pictures before the baby acne begins. You can expect that the rash will soon be a memory. The oil glands will disappear, and you won’t see the acne again until you turn around once, and your baby is a teenager. This time the acne will be evidence of hormones transforming your baby into an adult.